Design is a powerful force that shapes culture and it is a professional activity that is beneficial for both community and business alike. This blog is for all those who are interested in exploring these wider manifestations of design as a critical human activity and would like to shape its application across all human cultural and economic activities. 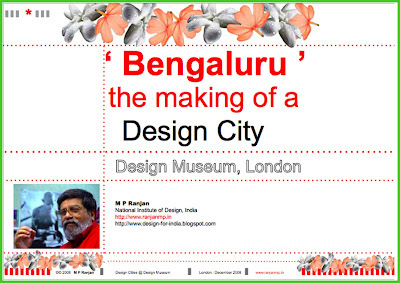 Image: Opening slide of my presentation in London at the Design Museum pitching for Bangalore, nay "Bengaluru" as the emerging design city of the world, provided the design community and the local political leadership get it right in the days ahead. I was invited by the British Council, London to participate in the Design Cities Debate at the Design Museum in London on 15th December 2008. On my way in here I wrote the following note to the DesignIndia discussion list since there was a raging debate already going on there based on the DNA news report that talked about my intention to speak about Bangalore as the potential Design City from India. The Design & Architecture team at the British Council had proposed this event to the Design Museum and it was through the support from the British Council in London and India that I managed to travel to London to participate in this exciting event. I am sitting in the lounge at Sahar Airport and have some time now to respond to all the very interesting discussions that came out of this thread on Design Cities and now on the Design Capital. I agree with you entirely that the concept of a capital based on a designer centric view is indeed an ego trip for the profession which is perhaps the last thing that we need to do in a climate of extreme lack of understanding of the core ideas of design as we know it today. I was excited when the British Council in London invited me to participate in the Design Cities Debate to take place at the Design Museum in London on 15th December 2008 since this would give us an opportunity to explore the idea of design as it would and perhaps could apply to the shaping of a city of the future here in India. For me this was not a call to see which city had already arrived there or which one had the most designers and design related companies, however these would be an influencing factor, but not always relevent, since sometimes design is better off without designers. Design for me is a basic human activity as well as a professional activity performed at many levels by a variety of professionals with their vast range of skill sets and an equally wide range of motivations and intentions, some deep and profound and some definitely shallow and short term, all of which may be needed and necessary based on the complexity and the context that is being addressed. My approach was therefore to look at this as an opportunity to articulate what would be the attributes and necessary ingredients for a city to be called a design city of the future in India and then I looked at which city in my opinion could make the grade in the near future provided the necessary conditions and the public and political support could be mobilised to meet this end. All cities have the possibility to be called a Design City if they are able to meeet the conditions that I hoped to articulate in the process of this debate. I chose Bangalore because I know it best and have been associated with the city from my childheeod visits in summer and I also see some very exciting things happening there that is far beyond the service provided by the practicing design studios, a sort of taking the design abilities and getting critical things done through the use of design thought and action in the public space. Here, I will comment that Poonam Bir Kasturi's Daily Dump is a shining example of such work that has the possibility not just to transform Bangalore but all cities in the world if the success here gets replicated in each local situation with the necessary local adjustments etc. Similarly the amazing success of Industree in mobilising 15000 women in rural India using local grasses and skills to provide fair employment and a hope for the future is another great example that is still work in progress. Bangalore has also had two great scale building examples with R+K going to WPP and IDIOM joining Kishore Biyani and these show the way forward to meet the huge responsibility that design and designers have to deliver in India today. The other design entrepreneurs in Bangalore and the design schools for a platform that can catalyse huge change in the public space and for me this is very important. Design for industry has been harped upon for may years and I am not very impressed by these achievements. However social good that can reach the aam aadmi or the man in the street is still a far away dream it seems. The IT sector in Bangalore provides us an opportunity to use web2.0 tools to reach public needs be it services or local assiatance in local governance. Bangalore with the Janagraha and other public domocratic institutions are working together with design to help transform. This for me comes back to the flower garlands that are made everyday in Bangalore and in many Indian cities, handmade strung flower by flower to make an ephemeral thread of fragrence that is worn on the head or offered in prayer on a daily basis. Nature has provided the abundance of flowers to Bangalore which is indeed the flower power of the world and the Rain Tree with its wide arching branches and its equally complex roots shows systems that we need to learn from so that our democracy can work as a designed offering to transform the city to a Design City of the Future. Bangalore can indeed show the way and I do hope that all our cities and villages will follow suit or take a runaway lead in a win win world of tomorrow. I am now in London and getting ready to join the other invitees from Brazil, Russia and China (The BRIC Nations) at an interview with BBC Radio at Bush House London and later in the day at the Design Museum for the Debate in the evening. I look forward to the event. More later. I'm impressed that you made these arguments in London - we need a new paradigm for the "design city". I completely agree that the argument of design for industry is worn out and harped on. I also continue to hear pleas for a good, old fashioned "well-being" argument, like this one last week: "sometimes all design needs to be is beautiful. It can lift the sprits no end, and that should never be underestimated in an increasingly troubled world". Isn't the trouble that everyone broadly speaking knows that, and yet society's estimation of the value of design has failed to increase. We need a harder argument for design and social good and the criteria you apply with respect to Bangalore are very interesting. I reserve the right to edit comments. Please keep it simple and to the subject. India needs design today across all 230 sectors of our economy. This is a space to explore some of the issues and perspectives that can contribute to a better understanding of these opportunities. Download some of our resources from here: Use "Right click" to open or download in new window. For more about our education process we invite you to see "Design Concepts and Concerns" blog here for live and contemporaneous documentation of courses in Design Thinking and Action offered by the author. Many of the papers and books listed here are available for download from the Acedemia.edu site at the authors pages here.